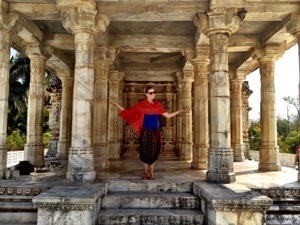 On our way to Udaipur, we stopped in the lovely little village of Ranakpur. On our way there, Raju decided, out of the blue, that he was giving us new names. We had all been in silent thought for a while when Raju turned around and made his announcement. “Your new name is Sunita!” He pointed at me. Uhh, okay Raju. “It is very famous Indian name, Sunita” Alrighty. I’ve had enough nicknames in my time, Sunita works for me. “And you… Anita!” He pointed to Kelsi. Of course we would have matching names. It doesn’t confuse people enough that we look identical to all Indians. Some of them stare at us perplexed when we say we are from different countries, trying to figure out how we could be twins and from the other side of the globe! Now we had matching names; it was going to confuse everyone. But from that point forward, we were Sunita and Anita to Raju. “Sunita! That your home!” Raju said, pointing to a dilapidated and broken down mud shack at the edge of the town. “Uhh, thanks Raju. It’s so lovely.” And then he giggled to himself for making such a funny joke. 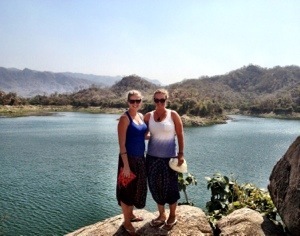 While in Ranakpur, we first hiked to the top of a small hill which looked over a gorgeous lake. It was the first sign of rolling hills and small mountains that we’d seen yet in India and the view was beautiful. The green background was quite a difference from Rajasthan’s golden desert to the west. At the foot of the hill was a small house and inside, a man who made handwoven dhurries for a living. Dhurries are like carpets, but the pattern is double-sided and the whole thing is a lot lighter. The process is fascinating! He showed us how he weaves the wool or silk or hair, through this wooden structure, and then uses a comb-like object to push all the material into place. One Dhurrie takes him 35 days, working 8 hours per day, to complete. Are you kidding me?! That’s insane. The man just sits there all day, pressing and weaving and designing beautiful looking carpets. It was amazing. That’s what they all say. But we were not about to haul around massive carpets on top of our already insanely packed bags. “I’m sorry,” I said “your work is beautiful, but I don’t have a home of my own to put one in!” I explained. “You don’t have a home of your own?” Some guy, obviously another tourist traveling on his own, popped his head around the pillar to talk with us. “That is very sad”. We laughed and chatted about where he had just come from. He was absolutely lovely and the first tourist we had spoken to in ages! He was so excited to hear that we were heading to Udaipur because he had just had such a wonderful time there. We were excited to hear about all the fun stuff to try in Udaipur. It was the first city we were visiting that we stayed in for two nights, which meant lots of time for exploring. “Ya, we’d love to get the name!” We started, then Raju cut us off. “Okay now, Chello! We go now, in the car” he practically stepped in between us and shuffled us towards the car. What? Wait. We’re in the middle of a conversation! We shouted apologies over Raju’s shoulder to the guy just as we were pushed into the car. “We were taking to him Raju. He was very nice!” We said. “No! We go now” he said definitively, and we drove off. We got out of the car without a word and walked away. We were going to go talk to everyone we saw, just out of spite. 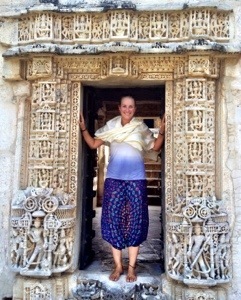 We stopped at the first temple which was small, but beautifully carved. It was all in white marble, with many carved pillars and unique looking designs. 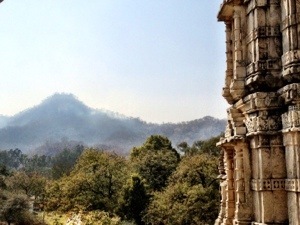 Ranakpur apparently is home to India’s biggest and most important Jain temple complexes: and that is what we were looking at. When we had finished with the first temple, we carried on to the larger and more complex temple. Sitting on a bench outside the large temple we ran across the guy we had just met at the Bhurrie factory. Just out of pure spite, he was going to be our new best friend for the afternoon. Lanz from Denmark turned out to also be one of the most genuinely nice people I’ve ever met in my life. He was one of those people who would get ripped off by everyone in India. He accepted flowers and photos and bhindis, then was asked to dole out money as needed. He did so with a big smile, not ever feeling taken advantage of. When it turned out that we needed to pay a fee for my camera as well (even though we left all our money in the car as instructed) he didn’t even blink an eye and paid for two cameras to enter. Every nice thing he did made us angrier at Raju. The second temple was absolutely spectacular! 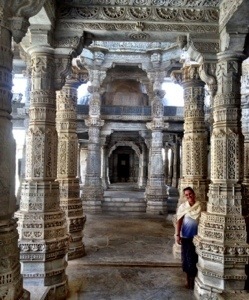 In the same milk white marble, this temple was a massive collection of rooms and pillars. The temple has 1444 individually engraved pillars, each one more elaborately decorated than the next. It was stunning! We must have spent 45 minutes or so just wandering around the place, looking in all the little crevasses and rooms that the place had. When we were done, we wandered back and found Lanz, with an awestruck look on his face only about half way through the temple. We thanked him for the camera and the information in Udaipur and wished him luck on his travels. Then we walked back to the car to find Raju, silently triumphant for disobeying his strict “no meeting people” rule. If it was going to be like this for the whole two weeks, we were going to have a problem. 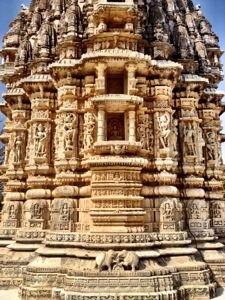 This entry was posted in Asia, India and tagged Dhurrie, Jain temples, Ranakpur by hilarylust. Bookmark the permalink.